Samus Aran has killed space pirates in so many different ways over the 31 year history of Metroid. She blows them up with missiles, rolls herself into a ball so she can bomb them to bits, hurls her own body at them like a lightning-charged cannonball, and even sometimes just shoots them with her gun arm. One thing she’s never really been able to do, though, at least outside of the Smash Bros. games, is haul back and punch a dude right in the jaw. At least until this week, with Friday’s release of Metroid: Samus Returns for the 3DS. 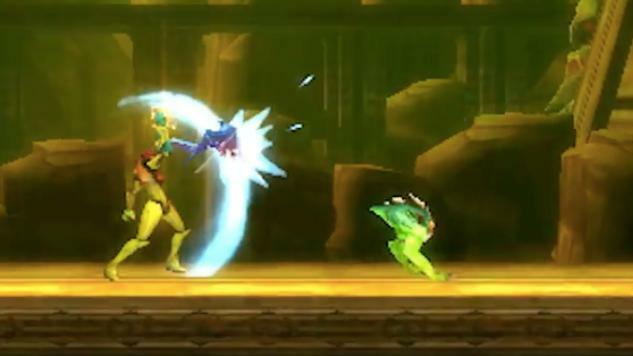 For the first time Samus has a melee attack. She swipes up in an arc with one of her arms, normally dealing only minor damage to the deadly denizens of SR388. When timed right, though, and unleashed right when an enemy charges at her, Samus can leave a foe stunned and reeling, quickly finishing them off with a well-timed blast. With its bright arc of energy, it might look a little bit like Guile’s Flash Kick from Street Fighter II, but it’s less of an attack than a defensive position. It’s a parry, not a strike. This might not sound like much for a series that has added numerous weapons and mechanics over the years, but it actually has a big impact on how you’ll play what is intended to be a nostalgic flashback. Metroid: Samus Returns is a “reimagining” of 1991’s Metroid II: Return of Samus, an early Game Boy title that was the first sign from Nintendo that Metroid wasn’t just going to be a one-and-done NES classic. Samus Returns, like the original Metroid games, is a side-scrolling platformer, the first time the series has returned to its original perspective since 2004. It’s specifically appealing to the original strength of these games and the audience’s memory of them, so it’s a little surprising that it also introduces something so quietly revolutionary. The melee strike doesn’t make Samus Returns feel less like a Metroid game. It just makes it feel different. You don’t have to lash out with it to defeat your enemies, but it makes it significantly easier for any of them that charge at you, and many of them will do exactly that. In the early portions of the game, especially, most of the monsters you come across will come charging at you, either swooping down from above or sprinting at you head-on. You can take them out with missiles or gunfire, but it takes several less hits if you can accurately parry that charge with the melee strike and then take them out with a shot or two. It’s not a seamless fit at first. Metroid lifers might struggle to integrate it into their regular routine of jumping, shooting and morph-balling. It also dictates enemy behavior a little too dramatically, especially early in the game; instead of watching for the movement pattern of an enemy and reacting accordingly, you’ll find yourself facing too many beasts that just come straight at you, waiting for the parry to knock them for a loop. Until you’ve adjusted to it, it can threaten to undercut the whole ‘Troid-like nature of a game that otherwise is almost shameless in its classicist mindset. When you do grow accustomed to it, though, you’ll realize how crucial this new wrinkle is. Samus doesn’t merely return with this game—she’s revitalized by it, and the new melee strike winds up being a significant part of that. and the need to backtrack, Samus Returns succeeds at capturing the atmosphere of a classic 2D Metroid game. And then it introduces this one new facet that turns the actual play on its head, injecting a new element of risk and reward to the classic action. It’s the kind of pivotal decision that can keep a series relevant well into its fourth decade.